"How To Attract A "Rush Hour" Load Of Traffic To Your Web Site With Little Or No Effort!" Are you looking for a way to increase the traffic to your web site that doesn't take a lot of time to manage? Have you been searching for a quality service that you can provide to your web site visitors that is "sticky" and will bring them back again and again? Then look no further because you've found it! 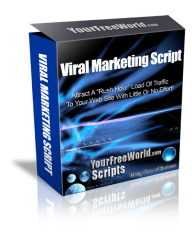 Our Viral Traffic Marketing script can generate tonnes of traffic to your site in next to no time. It easily installs on your web server and you can offer the program to your site visitors to join free. Not only will you receive targeted traffic, but it will also increase exponentially! What does that mean? It means the traffic to your web site will steadily grow more and more as it is promoted and more new members signup! at Work For You and Your Business 24/7! But how does it work? It's very simple. When someone visits your web site and they see they can join your viral marketing program free to increase the traffic to their web site, they need to go through our ingenious signup process. Here's how it works. The signup process has been implemented to gain the maximum exposure for each member's web site. When someone wants to signup, first they need to follow the instructions and visit the first web site on display. This is the sponsor ad and it is displayed in text format. Whose web site is the sponsor ad? Yours of course! This is where the web site owner starts generating some serious free traffic. So when the new member clicks the link for the sponsor ad, a new window opens that displays the web site you wish to promote. At the top of the page, a code is randomly generated and it displays after 15 seconds. This 15 seconds gives the reader time to view the web page and see if the product or service on offer interests them. When the code is displayed, the reader clicks the Copy to Clipboard link and returns to the original page. Then they paste the code into Sponsor Ad Code box where it says Enter the Ad Codes Below. Easy as pie! Once that step has been completed, the reader continues with the same process again, but for the next six text ads displayed on the page... Copying and pasting the code generated from viewing each page as they go through the process. Whose ads are in the next six positions? To start with, when you first promote your new program after installation, all the links will be yours! Then as people signup to become members, their link to promote will be shown in the number 1 spot and the other links will move down a number. This process will continue as more people signup under the link the new member promotes for their affiliate page. So what happens to the sponsor ad? Does that change? No. It always remains yours. :-) The beauty of this viral marketing system is that a prospective member can't cheat! They can only signup once they have viewed all seven links. Fair is fair right? Want to try it out for yourself first hand to see how easy it is for new members to signup? 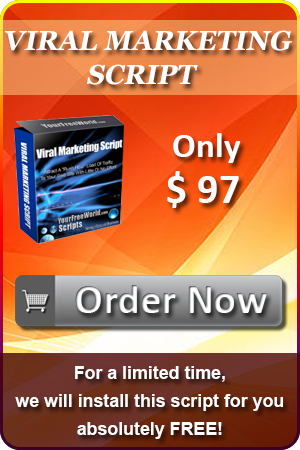 Click here to view a demonstration of our Viral Marketing Script. Can you imagine that even after promoting your program for a short period of time, the number of signups you could receive to your program and the amount of traffic this would generate to your web pages and your member's web pages? It would be phenomenal. We're Talking MEGA Traffic on Over-Drive! And We Mean MILLIONS Of Site Visitors! It's true. You CAN generate millions of hits to your web site and these are quality visitors... Not like an autosurf program where the person doesn't have to be in front of their computer actually carrying out a procedure to participate... Now the question is, do you think you can get ten people to signup to your program? Because that's all your members will need to do. 10 people join under you 1x10 Your website gets 10 new visitors! 10 people join under each of them 10x10 Your website gets 100 new visitors! 10 people join under each of them 10x10x10 Your website gets 1,000 new visitors! 10 people join under each of them 10x10x10x10 Your website gets 10,000 new visitors! 10 people join under each of them 10x10x10x10x10 Your website gets 100,000 new visitors! 10 people join under each of them 10x10x10x10x10x10 Your website gets 1 MILLION new visitors! Total hits your website will receive ==>> 1,111,110. WOW! These figures are based on the assumption that you and your downlines will each refer 10 people. The numbers in reality will be more or less depending upon you and your downline's efforts. But just think how running a viral marketing script like this could bring massive traffic to your site because everyone who joins... You got it! They are ALL IN YOUR DOWNLINE! :-) How powerful is that? And as you can see from the example above, the traffic will increase exponentially as more and more people join. What are the chances of that happening? They are extremely positive. The program is free to join and attracts thousands of free hits to your member's web sites that they are promoting! Why wouldn't anyone join a program that good? You've got to love the concept and our customers DO love it! So what can you, as a program owner of our viral marketing script expect? You can confidently expect to gain in excess of millions of new visitors to your web site. It all depends on your promotional efforts and let's face it, you can easily do that for free. If you want to generate more traffic than you care to count to your web site and offer a quality viral marketing program to your site visitors, you can't go past our Viral Marketing Script. It's simple and effective, but most importantly -- IT REALLY WORKS!